Arsenal on Monday night, April 15, climbed to fourth position on the Premier League standings after beating Watford 1-0 to keep their Champions League hopes alive. 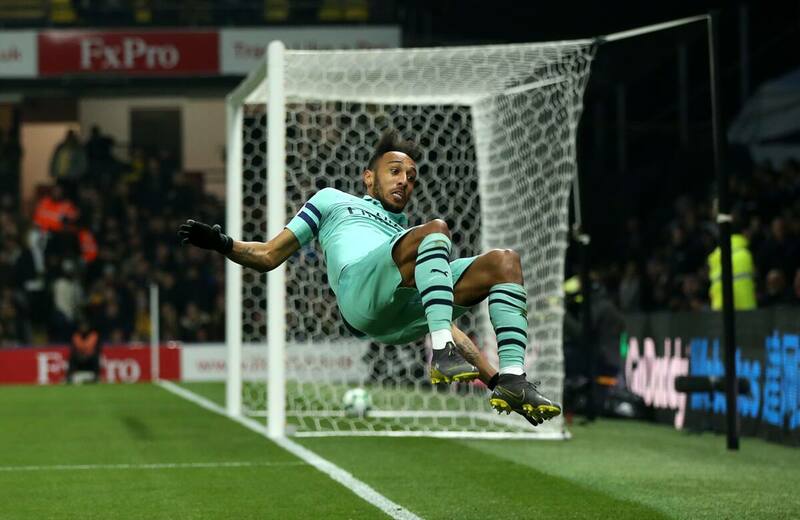 The Gunners scored their goal in the 10th minute through Pierre Aubameyang as Janmaat made a back pass to foster and the goalkeeper's poor clearance hit Aubameyang's ankle into the net. One minute later, Watford were reduced to ten men as Troy Deeney was sent off after an elbow on Arsenal's midfielder Torreira. Nigeria international Alex Iwobi had a good chance to score Arsenal's second goal in the 22nd minute when he was given a nice pass by Aaron Ramsey, but he was unable to beat Ben Foster. And before the end of the first half, Watford almost netted the equalizer through Adam Masina, but his long shot was saved by goalkeeper Bernd Leno. Arsenal had another chance in the center via a superb pass from Mkhitaryan and Aubameyang met it at the near post but he poked the ball over the bar. Watford had lot of chances to score in the second half, but they failed to make use of it. Their best chance came in the 84th minute when Janmaat crossed from the right and Hughes beat Mkhitaryan to the header, but the ball looped over the bar as the match ended 1-0. Earlier, Legit.ng had reported how Nigeria international claiming that the German football star is a team player that must be appreciated. Mesut Ozil has been heavily criticized this season by Arsenal fans and pundits because of his performances this term for the Gunners in all competitions.